Barcelona's philosophy fit Pep Guardiola "like a glove" but he took the club to new levels, says Dani Alves. Guardiola won three LaLiga titles during his time in charge at Camp Nou, also leading the club to two Champions Leagues in three years. The Catalan left at the end of the 2011-12 season but his spell leading Barcelona will go down in history for the club's stunning football and relentless collection of silverware. Alves was a key player for Barcelona during the Guardiola era, later signing for Juventus and then joining Ligue 1 giants Paris Saint-Germain. And the Brazil defender hailed Guardiola's impact on the club while noting he was a perfect fit for the head coach position at Barcelona. "Actually, without talking about the coach, Barcelona already have that philosophy inside the club," Alves, speaking at the launch of new Barcelona film 'Take the Ball, Pass the Ball', told Omnisport. "But it went to the next level, it grew, the concepts around the game developed. And it strengthened this club philosophy, this game philosophy. Who else could have done it? These ideas fitted Guardiola like a glove. "As a player, you watched him and you already saw a conductor. He just changed his outfit. These years have been amazing, we had a ton of fun, and we gave these years to the football world. "The most important thing is to win while leaving a legacy. We received but we also gave to football." 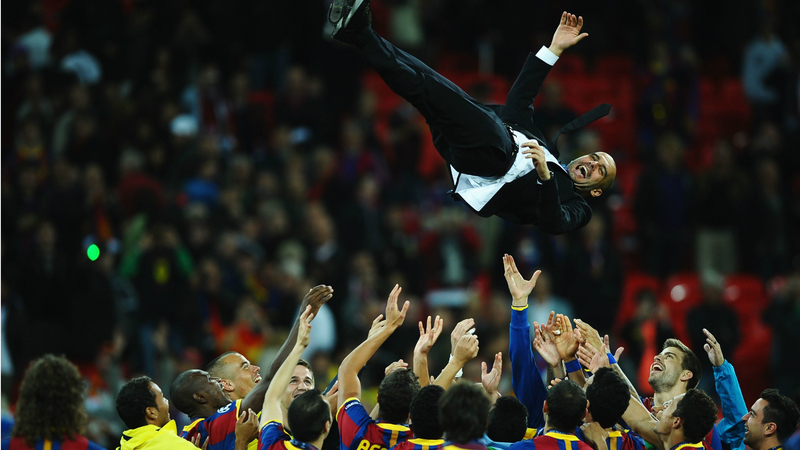 Arguably the pinnacle of Guardiola's Barca reign was their victory in the 2011 Champions League final, where a complete performance saw his side ease to a 3-1 defeat of Manchester United. "For us it was more special than the others because Barca had won in the old Wembley and we were returning with a new generation in the new Wembley," Alves added. "And let's say it, Wembley is something. Being able to win a trophy in that stadium, it's like winning a trophy in the Maracana. These are football temples. You make history as champion over there, it stays forever. "We used to say the 'cherry on the cake'. It's clearly the cherry of these years, of that team or even of Guardiola's time. We had already done many things in that club and in football. "But this title has been historic for many things, for how the season went. We enjoyed it a lot. I remember all the details. It was very special."